If you could choose 4 words to describe your companion animals I'm 100% sure these would NOT make the list. For most of us, the animals we share our homes with are not something -- they are someone. We know their quirks, their likes, their dislikes. We talk about them as part of the family. But this isn't how most animals in human 'care' are talked about. You won't believe these 4 words are used to describe living, breathing, thinking beings. Livability (noun): The likelihood that a chicken who is bred for meat will survive long enough to be sent to slaughter. For the chicken meat industry, the bottom line is how much meat they can produce. So chickens have been bred to grow as fast as possible. 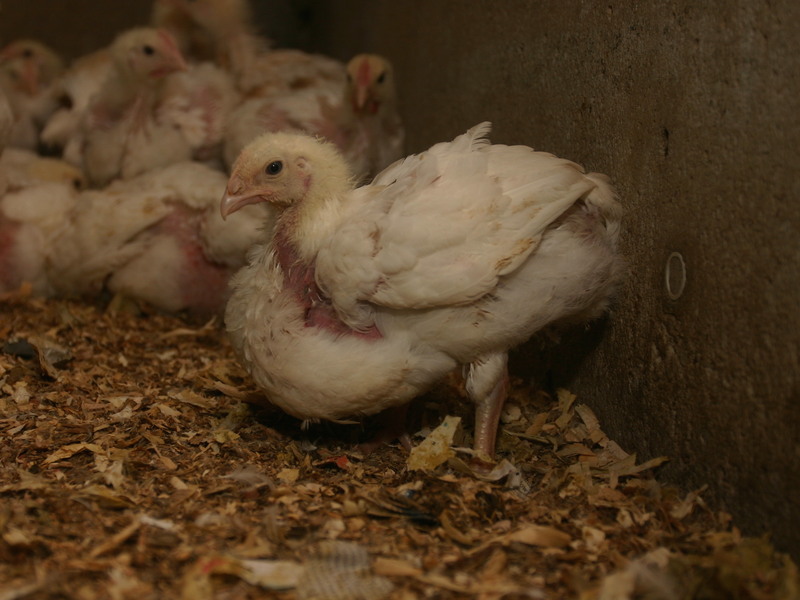 As a result of this unnatural growth, many birds do not even survive the 35 days or so before they are sent to slaughter. These baby birds --who still chirp and have soft feathers -- often become crippled by the weight of their overgrown bodies. Some starve when they can no longer stand up to reach food or water. For others, their organs shut down, unable to cope with their body's rapid growth. But for the industry the math is simple -- if the extra weight on birds who make it to slaughter brings in more profit than what they lose in dead birds then it's good for business. Chopper cow (noun): A dairy cow whose body can no longer produce the high volumes of milk needed for her to be profitable, and so she is sent to slaughter – usually to be turned into ground beef. Like humans, to produce milk cows need to have a baby. So cows who fail to get pregnant or who don't produce enough milk don't have value to the dairy industry and are trucked to slaughter. But it's not only older animals who face this fate. The moment calves are born they have often served their purpose -- to make their mothers produce milk. So every year an estimated 1 million calves are separated from their mothers and killed in their first week of life as waste products of the Australian dairy industry. Service date (noun): The date on which a mother pig is impregnated — either by mating or artificial insemination. Pigs are clever animals who will often seek out company and affection. Yet factory farms talk about them like they were machinery or 'units' on a production line. When a pig fails to get pregnant she will 'return to service' to be 're-served'. Sometimes farmers will think a pig is pregnant but after a full term she won't produce piglets. If this happens, she is labeled a "NIP" (not in pig). And, like faulty machinery, if she keeps failing to get pregnant she will be 'destroyed' and sold as low-grade pork. Spent (adjective): Used to describe an animal who can no longer produce enough milk, eggs or babies to be profitable, and so is sent to slaughter. Like dairy cows and mother pigs, there is no retirement plan for egg-laying hens. For all of these animals, when they don't produce enough to make a profit, they are disposed of like garbage. Most dairy cows are considered 'spent' by roughly 6-7 years of age and mother pigs at just 2-3 years of age. Egg-laying hens in Australia are sent to slaughter from as young as 18 months of age. In the language we use -- and in the eyes of the law -- farmed animals are so often treated differently to the animals we share our homes with. But in their capacity to feel pain, and in their desire to be treated with kindness, they are the same. If you agree that all animals deserve kindness, the power is in your hands. By making simple, kind choices, you can help protect animals, save lives and inspire others to do the same. Take the first step here. With every historical movement there is a group leading the charge -- the rally-goers, the protesters, the bra-burners ... the ones who speak out and make a change for the better. One day, I'm going to write a blog that says factory farming in Australia is officially extinct. Truth. We are getting closer and closer to that day every day. And you can be part of it. Thousands have already joined the movement to free hens from cages so small they can't stretch their wings ... to free pigs from stalls so small they can't even turn around ... and to end chickens being fattened so fast that they can't even stand up. I'm excited to tell you that this little pig will be flying across televisions in millions of homes across Australia. On her journey so far she has helped inspire everyone from huge supermarket chains to the little old lady down the street to take steps to help end factory farming. Change is coming ... and being a part of it couldn't be easier. It's as simple as refusing factory farmed products, eating fewer animal products or going meat-free. How will you take a stand for animals today? So Silly September is something I just made up right now because I don't know about you but I reckon I've had more wtf moments than usual in the last few days over stoopid ideas people have had involving animals. So I've decided to give a Silly September award to my top 3 picks for dumb things that happened (or didn't happen) to animals this month. AFL team Brisbane Lions thought they'd try and drum up some interest in their bottom-of-the-ladder football team by bringing a real life lion to their games. What happened: Aussies everywhere said NUUUPP! Because that's stupid. And the idea got scrapped. #PeoplePower! My advice: If you want more footy supporters, play better footy. Buy 10 pizzas – get a free living, breathing 5-7 year commitment! Um, Pizza Hut ... what were you thinking? Thankfully, not a single animal was given away before the stupidity was shut down. My advice: If you want to sell more pizza, make better pizza. What happened: Animal Liberation Queensland caught wind of this and encouraged sensible, caring people to speak up! The Leukaemia Foundation has since said that they've reviewed their fundraising guidelines and will make sure that any future events raising funds for them are animal-friendly. People power wins again! There's proof that when dumb ideas meet common sense, common sense can win! Let's hope these awards serve as a lesson to others to not do dumb things -- and to always speak out if you see dumb things happen! Have you got another nomination for a Silly September award? Or a people power success story? Put it in the comments below. And thanks for every time you've been a voice for animals. Assignments can be a drag no doubt but 14 year old Madi found a way to use her school project to create awareness about animals in factory farms :) And for that, she's our latest Activist Challenge winner! 'Freedom' author Madi is not only getting active by spreading the word for animals at her school she is also speaking out against factory farming at rallies! Are you doing something awesome to help animals? We want to hear about it! Enter our Activist Challenge comp and like Madi, you could win an Unleashed prize pack and a sweet rep for helping animals. Imagine an island almost completely inhabited by cute fluffy bunnies ... Oh wait, it exists! Okunoshima is a small island in the Sea of Japan. It has become popular amongst tourists because of the friendly rabbits that roam freely about the place. Unfortunately, not all rabbits are so lucky. Millions of animals still suffer every year from cruel tests. You can help protect them from cruelty by making the pledge to refuse products that have been tested on animals. Click here to sign your name today. The story goes that sailors left pigs on this tiny uninhabited island in the Bahamas intending to come back for them but never returned. And now they swim and surf and sunbathe all day every day. But only a little bit because it makes me super happy to see pigs super happy. They'll never have to go through the incredible suffering that millions of animals in factory farms experience right here in Australia. Not only may pigs in factory farms never see sun or sand, but the mothers are confined to crates so tiny that they can't even turn around, whilst pregnant! You can help free pigs from cruelty by pledging to refuse factory farmed products. Or better yet, by taking them off your plate altogether. A neat place to be an animal right here at home :) Kangaroo Island in SA is a massive wildlife sanctuary. So roos can just be roos – grazing in the morning, snoozing in the arvo and maybe some more grazing at night. Sadly, night time can mean an awful fate for kangaroos in other parts of Australia. If you love our native wildlife, the truth about kangaroo shooting might shock you. Click here to learn more and take action. ACT says NO cages and NO crates. Ever! 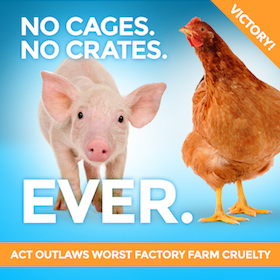 The ACT has officially become the first state/territory to ban three of the worst practices of factory farming. For good! Pig crates – Imagine living your whole life in your bathtub. Every day countless pigs suffer in this level of confinement, unable to even turn around. ACT SAYS NO WAY! Battery cages – A battery hen in Australia lives in a space smaller than an A4 piece of paper, crammed into a wire cage with several others. ACT SAYS NO MORE! Debeaking – Factory farmed hens often have the tips of their beaks cut off, to stop them from pecking at other birds. (You would too if you were suffering from severe stress.) NEVER AGAIN IN ACT! The best news is that we don't need to wait for other states to catch up. We can help end animal cruelty by simply showing that there's no demand for factory farmed products with the choices we make. Find out more at www.MakeitPossible.com. Which state/territory do you hope will be next to ban the cage? Something amazing happened in the ACT last week. Legislation was tabled that would make three of the cruellest factory farming practices ILLEGAL throughout the territory -- debeaking (cutting bits of a chick's beak off without pain relief), battery cages and pig crates. And the best news? This bill is expected to pass! This groundbreaking bill shows that an informed community won't tolerate cruel and inhumane practices, and sets an important precedent for all states to follow. Help speed along the day when ALL animals are freed from factory farms, by making kind choices today. Join the movement at www.MakeitPossible.com. It’s not always easy being the only GWS Giants fan in all of Melbourne, but I feel sorrier for Essendon supporters at the moment. The team’s been fined $2 million, dropped out of the finals and their coach is suspended for 12 months. Why? The team’s former sports scientist, Stephen Dank, was mixing all kinds of stuff in the players’ supplement injections, not all of which was entirely legal. Known as cerebrolysin in the medical world, pig’s brain extract has been said to help treat Alzheimer’s, but it is not approved for human use. Dank said he injected players with the extract in order to increase alertness. A swim first thing in the morning. Nothing like freezing cold water to make you more alert. Gingko biloba – native Chinese plant used to enhance memory. Grandad swore by it. Ginseng – Asian herb used to increase mental capacity. Colostrum is the first milk a mother cow produces after her calf is born. It is very high in antibodies and protein. Why? To make superior AFL players of course! Oh wait ... sorry ... it’s actually to nourish the baby calf and help him grow big and strong. Unfortunately, in order for big burly AFL players to have this milk for babies', the calves have to go without. And sadly, calves lose much more than just their milk in the dairy industry. There is some “flimsy evidence” that calf’s blood can help speed up recovery time for injured players. However, Essendon club doctor Bruce Reid (who described the club’s supplement practices as “ludicrous”) has said that “the recent opinion is that platelets and one’s own blood, probably does a better job.” This is not surprising since (I’ve said it before and I’ll say it again) humans are not cows. The worst thing about all of this is that not only have the Bombers been embroiled in a scandal -- and with devastating consequences -- but animals have been caught up in it too. Clearly, humans have recognised that animals have some pretty neat talents. But rather than admire these strengths, we’ve tried to take them for ourselves. Did they start cutting open pig’s brains when they discovered they are very intelligent animals – smarter than 3 year old children? Did people start experimenting with calf’s blood when they learned that newborn calves have the strength to stand up within minutes of being born, something that takes human babies months to achieve? The bottom line is that animals are being used to try to enhance the lives of humans but little thought is given to the needs and lives of the animals themselves. :( What ever happened to fair play? What other contradictions do you see in the relationship between humans and animals? RG compares pigs to his beloved best buddy George, pictured with Gosling below. (These two are so cute together that they have a whole tumblr page dedicated to their adorableness.) Ryan says that confining pigs for weeks on end is something that he would never dream of doing to George, "and that no compassionate Canadian would ever do to any animal." Pigs are getting an awesome rap in the media lately. Just last week, Australia’s former Minister for Trade hollered “Save the pigs!” in an opinion article. “Pigs deserve our attention and care,” says Dr Emerson. Thankfully, people all over Australia are starting to realise that we need to be taking better care of pigs. Make it Possible (our campaign to end factory farming) has just reached the 150,000 pledge mark. More and more people every day are being touched by the plight of pigs (and other factory farmed animals) and pledging to take steps towards a world without factory farming. If you want to speak up for pigs, like Ryan, then share MakeitPossible.com with your friends. Help us reach 200,000 Aussies pledging to end factory farming! This one simple (non-gory) image will change the way you think about animals who are born to be slaughtered in Australia. Prepare to have your mind blown. Nearly every animal in Australia born to be eaten or have their eggs or milk taken, will not live their full natural life. This chart shows to scale how much of their life they experience before they are killed to be eaten, or because they are no longer 'productive' enough to be kept. To give it some perspective: the average life expectancy for an Australian is almost 82 years. If you were a 'dairy cow', it would mean you shouldn't bother planning your 21st b'day. If you were a veal calf, you wouldn't even reach 2 years old. That's a really grim way to look at it - but the sad truth is that most animals in Australia are killed as babies. There are some lucky ones, though. They find their way to sanctuaries, rescue shelters and into the care of kind individuals and families. Pigs like Hope who ended up at Edgar's Mission, and calves like Esther at Brightside Farm Sanctuary. You don't have to rescue a pig and have her live in your backyard to be a lifesaver for these animals. All you have to do is decide not to eat them. It's such a simple change in your life, but it will make the world of difference to animals you no longer eat. Take the pledge to be veg, now! 5 animals who would totally get straight A's. Whether you can't wait to show off your report card, or whether you'll be 'filing it' in the bin before mum and dad see it - find out which animals would be top of the class if they went to your school. 1. Japanese macaques. These monkeys would definitely snag the Home Economics prize, as they are known to wash sweet potatoes in river water before eating them. Not only that, they since learned that washing the taters in sea water infused them with a pleasant salty taste. MasterChef ... or MasterChimp? 2. Finches. Language class would be no problem for finches who "talk" to each other using proper grammar. A field study found that finches ignored remixed versions of their own songs, because the jumbled up versions made no sense to them. This suggests that humans aren't the only animals able to order sound logically. tbh, if it's super-early in the morning, I can barely order sounds logically myself. So, well done finches! 3. Ravens. Excellent problem-solvers, they would dominate at school. They have been known to use sticks to get insects out of logs and even drop walnuts in front of cars to crack them open. Check out how smart they are in this amazing test. That awkward moment when ravens solve a problem quicker then you would have. 5. Dolphins. Have you ever been cramming for a test or pulling an all-nighter to get that project done - only to give in to the temptation of sleep? Dolphins don't need to worry about that, because they sleep with only half their brain! They can carry on their normal routines indefinitely, which means while you're snoozing ... they're studying. So there you go, the five animals who would totally get straight A's if they went to your school. Good luck if you've got exams at the moment, or if you're coming up to end of year tests. Study hard, get through them ... then two months of party time! Get a pig's eye view of the world. Check out this online simulation that puts you into the shoes of a mother pig in a factory farm. This is what they experience for up to four straight months. How long can you handle it for? How did you go?? How long before you wanted to bust outta there and free your fellow pig prisoners? I think my record is 22 seconds. Pigs are renowned for their intelligence and curiosity (studies have recognised that they are as smart as 3 year old kids) - yet in factory farms across Australia it is seen as perfectly acceptable to keep mother pigs confined in sow stalls like you experience in the simulator. Hero pig saves baby goat from drowning! Can I just say straight off the bat, that I am constantly being amazed by pigs? It seems like not a week goes by when I don't hear a story of how impressive these little oinkers are. The latest one that had me shaking my head in wonder is the footage that shows a pig saving a goat from drowning! Yes - you read that right. Watch the drama unfolding in the clip below! What an amazing story. That pig is a hero in my books. And can I just say - thank Goat the pig was there, because the guy filming hardly covered himself in glory. Would it have killed him to put the camera down and help out?? But I'll move on. So, we can add "heroic" to the list of things we now know about pigs. Did you also know that they are playful and will wag their tails like a dog when they're happy? And that they've been found to be smarter than dogs, and even as smart as 3 year old children! But did you know that pigs need some rescuing of their own? In factory farms, pregnant mother pigs can legally be confined between bars for four months straight, with no room to even turn around. Piglets can have their tails (and balls!) cut off with absolutely no pain relief. And the sad fact is, that for most factory farmed pigs in Australia, the day they are trucked to their deaths at an abattoir, their last day on earth - is the only day they will ever feel the sun on their back. Pigs are amongst the most mistreated animals in the world. Their very intelligence and charm only makes the cruel treatment dished out to them in factory farms even worse. You're probably thinking that what is legal to do to pigs in the name of profit is pretty shocking. You'd be right. And when farmers break the rules, it can get even worse. You may remember the shocking conditions at Wally's Piggery in NSW last month, and the horrible deaths pigs faced at a Victorian abattoir in December last year. Luckily, rescuing them from factory farms couldn't be easier -- simply choose not to eat them. 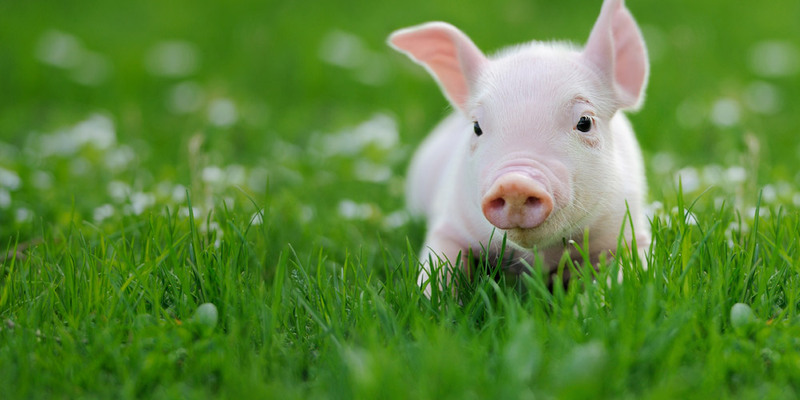 Take the pledge to go veg, and save almost a hundred animals (not just pigs) every single year. With your kind choices at meal time, you can be the lifesaver that these animals so desperately need. Unimaginable cruelty at NSW piggery! Sometimes you see or hear about something happening, and it changes your life forever. For many people, it might well be the footage and photos released last week of a piggery near Canberra. An investigation by Animal Liberation ACT and Animal Liberation NSW revealed some of the most appalling cruelty and neglect ever filmed on an Australian factory farm. You can see footage and photos from the investigation here (WARNING: the content of the website is very distressing). Just 20 mins drive from our nation's capital, workers were shown kicking piglets across the floor. In a room next to their mothers (within ear shot), young pigs screamed as they were beaten over the head with a sledgehammer and then slaughtered without any effective stunning. Footage shows some pigs apparently conscious and struggling for minutes after their throats had been cut. Buckets were filled with dead piglets, and various types of injuries and infections were left untreated. The footage is like some kind of sick horror movie. Amidst the brutality and neglect, the scene I found perhaps most heartbreaking was a mother pig standing in a tiny crate, just being continuously pounded by a flood of water from a burst pipe. That these intelligent and sensitive animals could be treated so horribly is just devastating. Even though a lot of what was filmed showed illegal cruelty, the legal practices filmed will also shock you. Piglets have their tails and teeth cut off without painkillers. Pregnant sows are confined to tiny crates where they're not given enough room to even turn around. This is legal and standard practice in piggeries across Australia. As is the dank and dark conditions evident in the footage. For many factory farmed pigs the first time they will feel the sun on their backs is also their last as they are transported to slaughterhouses to be killed. Unfortunately, the abuse at Wally's Piggery isn't the first time (even recently) that farmed animals in Australia have been subject to such mistreatment. Earlier this year, a review in NSW found animal welfare breaches at *every* single slaughterhouse in the state. And late last year, an abattoir in Victoria was permanently closed because of extreme cruelty. Hopefully, anyone involved with Wally's Piggery will face the full force of the law for what they've done. This won't help pigs who continue to experience fear, distress and cruelty in Australian piggeries which aren't breaking any laws, though. If you want to make a real difference to them, then don't eat them. By going veg you'll single-handedly save 100 animals every year, and you won't be contributing to an industry that puts profits before the welfare of animals. If you've already gone veg, what was it that helped make your decision? If you've ever seen Earthlings, then you'd already know that what happens in slaughterhouses is pretty horrific. Really, if most people could see what happens to the animals that end up as meat on their plates, they'd seriously reconsider whether they want to eat meat. Here's another reason why people would rethink their dinner plans: The NSW Food Authority has just finished a review of all the domestic slaughterhouses in NSW. Guess how many of those places needed to be told to clean up their act? The review started after nightmarish footage was taken at Hawkesbury Valley Meat Processors by Animals Australia member society, Animal Liberation. But hey, this is hardly the first shocking footage to come out of a slaughterhouse recently ... remember the pigs being stabbed in the eyes at a Victorian slaughterhouse late last year? If you've already seen it then I'd say you probably do remember it. Way to kill a party! If you were hosting a party, which of the following things would you probably NOT organise? A guest list, food, music ... or severed pigs heads? It looks like Melbourne company NEUW Jeans decided, "what the heck ... let's get all of 'em!" If you don't believe me then just check out the photos. I pretty much live in my jeans, but these hipsters have kinda put me off denim somewhat. The dead pigs, partygoers stressing out piglets - for once I'm actually HAPPY I didn't get invited to a party. Well, the photos pretty much speak for themselves with this one but something just struck me. I wonder if the people at the party had seen the footage of just how terrible things can get at an abattoir. If they had, I doubt they would have been in the mood for much partying. If you want to let NEUW Jeans know that cruelty is never in fashion -- then leave a comment on their facebook or twitter. **UPDATE** Since posting this blog, it seems that NEUW have not only removed disturbing pics of butchered pigs from facebook, they may also have turned off their public comment feed. So, if you're having trouble leaving them a message, never fear -- click here. This could be a scene from NCIS! Describing in graphic detail how the victim suffered before they died always makes for riveting television -- but this victim is one of millions of chickens going through this every year right here in Australia. There won't be any murder investigations here, but who needs to watch NCIS when there's gruesome tales of broken bones or prisoners being locked up and never seeing the sun, right there in the meat section of the supermarket freezer? These are stories that need to be told -- kudos to Voiceless for these awesome ads, and to Hugo Weaving and Abbie Cornish for using their fame to speak up for factory farmed animals. Please share these ads on Facebook and Twitter and get more people talking about how we can all help animals every day! Tell us -- which of these ads would you most like to see on TV? You may not have heard of the artist, Miru Kim before. Even when you look at these photographs of her, you may have a hard time seeing her at first. It's almost like an overly artistic "Where's Wally?" and when you finally spot her, it may shock you as to how well she blended in to a herd of pigs! "Pig eyes are remarkable. They see right into the eyes of a human being. When they were looking at me, exposed before them, surrounded by them, I could not read their gazes, but they were somehow shockingly familiar. There was no language to bridge that disparity - the mysterious gap between the gaze of a pig and that of mine. But when I mingled with them with my skin, the gap momentarily closed in, as if I had forgotten my own language. My words were lost, and I felt the swinish grunts resonate inside me." The close up images of the skin on skin are striking, aren't they? It's difficult to see where Miru ends and the mother pig begins. There are so many similarities between us and pigs, and not just in skin. Like us they each have unique personalities. Pigs are also considered one of the most intelligent animals outside the primate family - as smart as 3 year old children. And like us they can be affectionate and playful. While there may be many similarities between humans and pigs, our lives could not be more different. In a couple of the photos you can see the barren single pens that mother pigs are often locked in during their pregnancy. In Australia, these clever pigs can be kept in those cruel sow stalls for as long as 16 weeks - their entire pregnancy! Imagine not even being able to turn around for 4 months! Even the group pens for younger pigs are a crowded affair. Miru can barely fit in there! And those pigs have had to endure much more than just the stress of a crowded pen. At just a few days of age they would have had their teeth cut right back, their tails cut off and the boys may have been castrated - all without pain relief! Sadly, unlike Miru, who left the farm after finishing her photo shoot, these pigs will only leave their life of confinement on their last day of life - in a cramped truck on the way to the slaughterhouse. I love that these photos challenge people to see pigs in a new light. What do you think of these pictures? Thanks for being amazing! I appreciate everything you've ever done for me. But above all else, thank you for showing me what compassion is; thank you for encouraging me to think for myself; and thank you for always supporting my decisions. If it weren't for these simple gifts that you've given me, I doubt I would be campaigning for animals today. It fills my heart with sorrow to know that unlike you, many mothers won't feel loved and cared for this mother's day (or any other day of the year). For new mother pigs, pinned tightly between metal bars, unable to properly nurture their newborn babies - used as nothing more than milking machines - this Mother's Day will be just like any other day of their lives: miserable. But you've taught me to be an optimist. And one day I hope they will be as happy and free, with their family, as you are. Thank you for giving me all the space I need and the voice to speak for them and work towards that hopeful day. I promise to take what you've given me and do all that I can to make this world a better place for everyone. Japan Ends Whaling Season - Woo! They say whales are smarter than your average bear (sorry, for the Yogi reference, I couldn't help myself)... not unlike pigs, who have proven themselves to be quite the clever creatures. In fact, pigs have even been trained to play computer games! Yup... with specially designed joysticks pigs can pick up on how to play intelligence testing games just as quickly as chimpanzees! Whales are also well known for their strong bonds between mother and calf. Mother and calf... hmm... sounds just like another familiar furry, doesn't it? Mother cows also form a strong bond with their calf within hours of being born, and this bond only strengthens over time. As for their songs...? Scientists suspect that some species of whales sing to their young - something mother pigs are also known for (not to mention hens clucking to their eggs). But perhaps even more surprisingly, the author Jeffrey Masson tells the story of a pig who liked to sing to the full moon. Now that's something I'd like to see! But the thing that I think really captures people's imaginations with whales is their playfulness - the way they leap out of the water, often for what seems like the sheer joy of it. I'd like to think that if more people saw footage like this playful kid goat, then the Aussie public would be as concerned about the treatment of farm animals as they are about the hunting of whales. wdyt? Pardon a Pig and Join a New Tradition! When it comes to Christmas, there's a few traditions you just can't go without. Decorating a tree, pulling bon bons, making the most of the colourful paper hats and lame dad jokes inside said bon bons, wrapping (and unwrapping) presents, wrapping your sisters in tinsel, wearing crazy reindeer antlers on your head before putting them on Grandpa and taking his photo as he snoozes in his chair, searching out the one CD your parents have that is full of Christmas songs to be played over and over again, eating so much great vegan food you have to undo the button on your jeans and have a nap ... I could go on! And I will! Because there's a new tradition to add to the list, and it's going to catch on like wildfire! In the United States, the president pardons a turkey each year at Thanks Giving (Lucky turkey! Too bad it's only one!). Here at Unleashed we invite every single Australian to Pardon A Pig for Christmas and leave them off the Chrissy menu! Quite frankly, there's too many legs of ham sold at Christmas time for my liking, let alone for the liking of the millions of pigs who used to walk around on them! The suffering of pigs confined in factory farms is immense. From mother pigs being confined to sow stalls and farrowing crates that severely restrict their movement, to piglets having their tails, teeth and testicles sliced off without pain killers, the festive spirit never quite finds it's way to factory farms. So join in the new tradition and get everyone you know to take part (wake Grandpa up too to make sure he doesn't miss out!). Let's help all animals to feel the kindess and giving spirit of the holiday season! This hard hitting radio campaign first hit airwaves 2 years ago and stirred up quite a response! Now, Lucy's back and urging shoppers to spread the Christmas spirit and help free animals from factory farms. Most of us look forward to Christmas as a time to see family, give (and receive!) presents, and relax. But pigs, chickens and turkeys have little to look forward to at this time of year. The demand for ham, turkey and chicken at Christmas-time, makes the holiday season the peak time of year for animal suffering in Australia. Inside factory farms preparation for Christmas has begun, and that means even more families pulled apart, with piglets taken from their mothers, fattened up and killed; and even more chickens packed into sheds by the thousands and left to marinate in their own waste for their short and miserable 42 days of life. Animals in factory farms don't receive even the simplest gift of kindness, and in their unnatural cramped environment will likely never know what it is to relax. But enough with the doom and gloom, 'cause all of that can change. All it takes for Christmas to be a peaceful time of year for all is for people to take pigs (and our feathered friends) off their plates and celebrate the festive season with a cruelty-free feast instead. And with any luck, many people who hear Lucy's plea for help will do just that! I know I'm not alone when I say that in my swimmers I sometimes feel ... well, porky! But I know I'll never look this porky in the ocean! We've discovered a whole family of pretty porkers on Big Major Spot Island who can put all my fears to rest. These cute little pigs have nothing to do all day but sun themselves on the sand and swim in the crystal clear waters of the Bahamas. Nice work if you can get it! Have you ever seen more contented babes in your life? Aside from doing wonders for my body image, these piggies lift my spirits because I know that these swimming swines will never have to endure the torture that millions of pigs on the other side of the world have to put up with in factory farms across Australia. Piglets born in factory farms have their tails cut off through the bone without pain relief. They are then taken away from their mums and fattened up in crowded pens, only to be slaughtered -- but not before being gassed or electrically stunned first. Are you stunned yet? I am, because it gets worse. It should be plainly obvious to anyone lucky enough to swim among these precious pigs in the Bahamas that pigs would rather be our friends than food. But you don't need to leave town to be an angel to pigs -- YOU can help make their dream come true by taking the pledge to be veg! Ah, I'm dreaming of the day people and piggies all over the world can swim happily together ... and not look too porky in the process!! Now with the weather warming up, don't you feel like taking a dip now? If you thought last week was full of good news for animals, that was just the beginning ... the good news has just kept coming this week! Yesterday Australian Pork Limited announced that they were "pursuing a voluntary phase out" of sow stalls by 2017. Now we all know that 2017 really isn't soon enough - I mean Coles has committed to doing the same by 2014 - but this still marks a major victory and means ultimately millions of mother pigs will be spared a miserable life of solitary confinement. But wait, there's more! This morning Coles added another to their recent streak of animal welfare improvements. They've announced they will be completely ditching their own brand of cage eggs by 2013. I don't think I need to tell you that this is good news for those who care about animals and bad news for animal abusers. I'm gonna say it... this is the beginning of the end for factory farming! Supermarkets and industry (or at least the pig industry) are seeing the writing on the wall. Factory farming's days are numbered. Really, once the public realises that piglets have their tails cut off without pain relief, or that chickens raised for meat are crammed into sheds by the thousands only to marinate in their own waste for 42 days before slaughter, will they want to support those practices? I think not! At this rate we'll be out of a job in no time (ok maybe that's wishful thinking). But really, if you want to help put us out of a job and give animals the ultimate protection they deserve then the answer's simple - don't eat 'em. Tell me, what factory farming practice would you like to see put into the history books next? This has been an AWESOME week for animal victories! And what makes these wins that much sweeter is that they wouldn't have happened without us! That is Unleashed members like YOU! First we found out that the brutal plan to trap, transport and slaughter Tasmanian possums at a notoriously cruel abattoir has been rejected by the federal Environment Minister. Tony Burke couldn't ignore over 500 emails from us outlining that there would be no way to carry that out humanely. Now no possum has to face the shear terror of a slaughterhouse for the export market! Next up, Coles announced that they will phase out any products from piggeries using sow stalls from their own range of pork, ham and bacon (side-note -- yuck!). This means that by 2014, Coles won't be supporting any pig farmer who, cruelly yet legally, confines mother pigs in cages barely bigger than their bodies while they are pregnant. Less pigs trapped in sow stalls means more pigs with space to do simple things like turn around. There's still a long way to go before Coles can call themselves cruelty-free, but these changes are coming about through pressure from consumers (and of course from gorgeous Lucy Pig!). And finally, last night the Ku-Ring-Gai Council voted 7-3 to ban cruel exotic animal circuses! This ban was actually already in place until the circus industry applied enough pressure for the council to backflip in August and overturn the ban. This outraged the public, but one thing Unleashed members know how to do is make their voices heard. Thousands of signatures on the Animals Australia online petition -- or as I like to call it -- the deafening roar, convinced councillors that lions (and tigers, and monkeys...) don't belong in the circus! I just have to say thank you, thank you, thank you to all of the incredible Unleashed members that have played a massive part in improving the lives of these beautiful, innocent animals. We are their voice -- this shows how powerful we are when we speak up! 4.4 Million Reasons to Help Pigs! It is incredible to think that if I brought a little piglet home and named her (come on, we've all thought about it!) she would learn that name in no time and come running every time I called her - Ruby! Olive! Doris! (I can't choose). But studies have shown this to be true, meaning a pig could potentially be as wonderful a pet as a pooch! Pretty shocking stuff, right? What's more shocking is that this is happening all over the world - Australia included. Every year, in Australian factory farms, over 4 million scared piglets endure painful procedures like having their teeth cut, and tails sliced off -- all without pain relief. Those 'farrowing crates' that can be seen in the vid are used in piggeries across Australia too. Did you know that pigs wag their tails when they're happy, just like dogs? Well, scientists believe that pigs are actually smarter than dogs. Now can you imagine if someone did these sorts of things to your dog (or your cat)? You'd make sure they saw the inside of a prison cell for a mighty long time right? Even though these awful practices are still legal in Australia, pigs are slowly, but surely gaining a stronger voice as more and more people (including big players like Coles) are beginning to wake up to the horrors of factory farming. But what can you do to ease their suffering RIGHT NOW? Don't eat pigs! It really is the easiest and simplest way for every person to help pigs straight away. And if you've already taken piglets off your plate (I love you, you're ace! ), try to speak up and make their voice louder every chance you get! PS Click here for further info on the effects of your meat free diet! Whenever I see footage of animals in factory farms or at the slaughterhouse I can't help but think "Run! Run!". If only...! In '98 two piglets in the UK, Butch and Sundance, did just that. They escaped from the back of a truck, squeezed through a fence, swam across a river and vanished into a nearby garden. The pair were on the run for a week before they were finally caught. By that time their story was on the international news and the public were so taken by these two escapees that they were rewarded by being given a home in a farm sanctuary. So what goes through the mind of an escaped pig? Illustrator extraordinaire, Donn Pattendon asked this question for his most recent artwork, 'Escapee'. If you've taken a stroll through the back catalogue of blogs on Unleashed, then you've probably come across some illustrations by Donn before. He won the People's Choice Award at last year's Illustrators Australia 9x5 Exhibition with a very clever take on battery hens. His entry for this year's 9x5 Exhibition is another great illustration shining the spotlight on factory farming. And the cherry on top, is that Donn has kindly offered to donate 20% on the sale of this artwork to Animals Australia! If you live in Melbourne and want to check out the exhibition (and vote for Donn's piece for this year's People's Choice Award), then below are details. If you don't live in Melbourne, then you can check out the rest of the exhibition online by clicking here. Opening night: Friday 17th Sep 6pm, Silent Auction, drinks nibbles and a chance to purchase original illustration on 9x5 wood, prize giveaways for People's Choice Awards. Gallery open for one day only; Saturday 18th Sept 10am-4pm. Right, so back to the question... What do you think would go through the mind of an animal escaping from a factory farm? Kendra Cooks Cupcakes with Compassion! Fantastic Animals Australia and Unleashed supporters continually amaze and delight me with the creative ways they speak up for animals. From leafleting and protests to simply talking to their friends about why they should consider animals, I'm proud to be part of such a wonderful community. And last week was no different. We received an email from supporter, Kendra, to let us know that her workplace was now full of people who had recently taken the pro pig pledge after learning about the cruelty of sow stalls. How did they find out? Check this out! Kendra used her culinary skills to create these eye catching cupcakes highlighting the plight of mother pigs in factory farms across Australia. It sounds a bit odd to say that seeing those sow stall cupcakes made my mouth water. I feel a bit better saying that the greener cupcakes look just that bit more appetizing! Cupcakes were the order of the day all round Kendra's office, but none generated more buzz and discussion than her sympathetic sweets! And she no doubt changed a few workmates' buying habits at the same time. Nice one Kendra! And thank you from the pigs! Has this inspired you? What are you gonna spell out in the icing of your next batch of cupcakes? An Even More Disturbing Side to Bacon! What is it with people who are obsessed with bacon? I mean, I'm all for creativity with food... 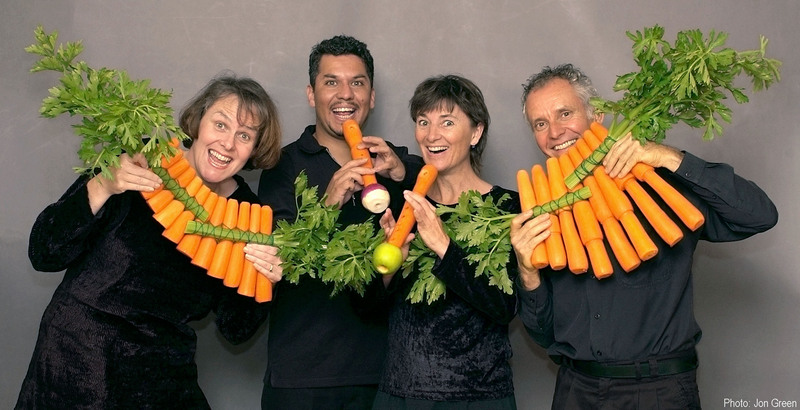 Seeing someone make a flute out of a carrot is very cool. But this obsession with putting bacon in everything is just plain disturbing. Take for example, bacon ice-cream... ICK! Sure, I used to like bacon - before I realised the piglet on my plate had his tail cut off (cutting through bone), his testicles sliced off, and his teeth snapped down to the marrow (and nerves) inside - all without pain relief. It's hard to tell yourself "but it tastes good" when you know that BLT was an abused animal - especially when you could have a tasty FLT (facon, lettuce and tomato) without any casualty. Bacon Tuxedo: Apparently this suit not only looks like bacon, but it has been chemically treated to smell like bacon. So just like real bacon, it probably increases your risk of cancer. Bacon Mints: If BK Flame was the perfect way to ruin your first date. Then this is guaranteed to ruin your first kiss. I could keep going, but I think I've had enough of thinking about dead pigs. What do you think of this obsession with bacon? Got another 'craze' that bugs you? Leave a comment. Coles Comes to the Pig Party! Some days it is just so exciting to be a part of the Animals Australia Unleashed team I can't even tell you! After years of campaigning against factory farming, we were excited to hear Coles announce today that they are committed to having a completely sow stall free homebrand pork range by the end of 2014. What does this mean..? 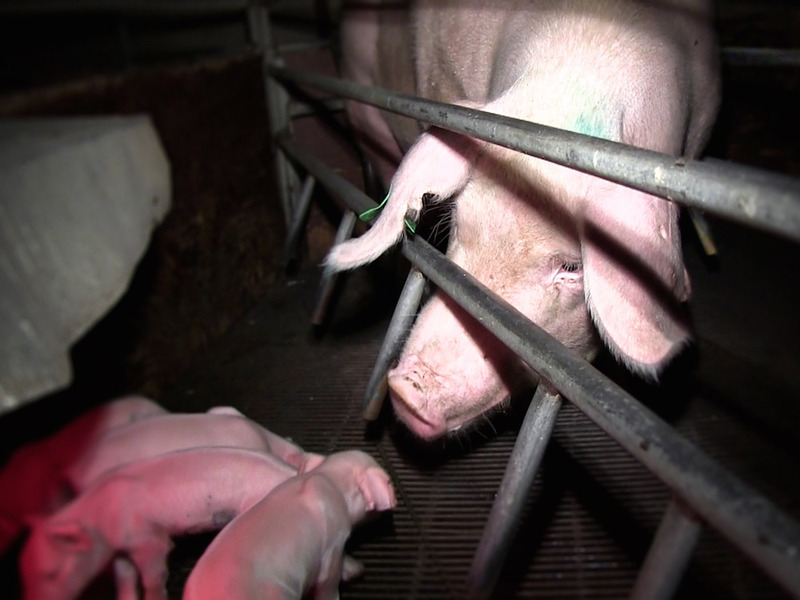 Locking mother pigs inside 'sow stalls' is one of the cruellest things ever done to animals in Australia. The stalls themselves are not much bigger than the pigs' bodies, meaning they are stuck in one spot and can't even turn around for up to months on end. Pigs are smart, curious individuals - much like dogs! - and it's shocking to think that for the sake of pork, bacon and ham, this type of cruelty is still legal in Australia. Fortunately, Coles has started to use their power to help end some of the worst abuse suffered by pigs on factory farms. Anyone feel like celebrating?! We have every reason to! For the very first time in history one of Australia's state governments has recognised that mother pigs imprisoned in sow stalls for months on end, don't deserve to suffer. Sow stalls will be banned in Tassie! Sow stalls are a seriously cruel business! They are literally tiny metal cages that are so small that mother pigs trapped inside can't even turn around or walk more than one step. Thousands of pigs in Australia are forced to stand in these cruel cages, with nothing to do all day, often for months at a time. Imagine if we were forced to endure this? No wonder most of the pigs are depressed and stressed out! They are after all one of the most intelligent species on the planet! Tassie will phase out sow stalls and totally ban them by 2017. This sets the rest of Australia a great example as well as applying pressure for them to do the same. We all know that the quickets and simplest way to help pigs is simply not to eat them ... but whilst we're waiting for the rest of the country to catch up and go vegetarian, today's decision will help alleviate some of the worst animal suffering caused by cruel meat industries. I don't believe this could have happened without the support of thousands of Unleashed/Animals Australia supporters who care about animals. It's their support that's made it possible for Factory Farming TV and Radio Ads to air and to make a big impact. So it seems that we do have the power to make a difference when it counts! It feels so good to be involved in directly helping animals, who without us would continue to suffer in silence, day in and day out. Now let's get every other state to follow! BK Flame: A body spray by Burger King, which as they describe it captures "the scent of seduction, with a hint of flame broiled meat.". Puke! That's what I'd call 'date-free deoderant' - for the man who likes to be alone. You know you've hit rock bottom when you stink so bad that smelling like a dead animal from a greasy fast food joint is an improvement! I've got to ask... Girls, do you want your boy to smell like 'flame broiled' animal flesh? I didn't think so! Personally, the last thing I want is a constant reminder of Hungry Jack's (owned by Burger King), and the fact that the way they treat their animals stinks! Mother pigs in crates so small they can't turn around; piglets having their tales cut off without pain relief; hens in cages where they'll never be able to even stretch their wings... These are just a few of the things that come to mind when I think of Hungry Jack's and just a few of the things I don't want to be thinking about when I'm freshening up for a date. If you agree that the way Hungry Jack's treats their animals stinks, then sign the petition calling on them to stop caging their animals. You can also print this petition out and get all your mates to sign too. How Many Mums Can You Spoil in One Day? One, two, three..? How about thousands! That might sound like a tall order, but every year Animals Australia finds a new way to spoil your Mum, whilst also helping out the thousands of mother animals who are locked up inside factory farms. Looks preeeeetty swish, huh? The real value in this gift however is the bit you don't see in the picture. Each 'Growing Gift' helps to fund important campaigns to end factory farming, like this one, this one and this one. Pigs are one of the smartest animals on the planet -- as smart as dogs and 3 year old children! Yet in factory farms mother pigs are locked up in tiny crates so small they can't even turn around. Pretty shocking, right? Well someone needs to stand up for these amazing animals. And that someone is us. So if you haven't worked out what to give Mum for Mother's Day yet, then maybe this is it! So now you know what I'm planning for my Mum this Mother's Day. What are your plans? Mad Cows or Just Mad Eating Habits? Mad-cow disease is an illness affecting cattle - caused by feeding cows to cows. Nasty stuff! But it gets even nastier! If humans eat this infected meat, it can cause the fatal disease, called Variant Creutzfeldt Jakob Disease (you know with a name that long it's gotta be bad!). Sure, these countries claim to have the all clear from mad-cow disease now, but any country that used to feed cows to cows doesn't sound like a smart place to import beef from (not that killing cows sounds like a good idea to begin with). Anyway, while turning cows into cannibals before eating them sounds pretty mad, we've got some home-grown nastiness to worry about - a not-so-little thing called factory farming. And while it's gross - what goes in must come out. The major problem: The huge amount of waste produced by factory farms is not treated, like human waste is. In the case of pigs, it is channelled into massive, open-air cesspits. These "lagoons" (as the industry calls them) can pollute the soil and underground water supplies, and run-off can wreak havock on local waterways - not to mention the health risks to the local community! But, no need to worry! Like a wizard, I have the perfect solution for you! And while you're at it, you'll be helping heaps of others in a big way. What is it, I hear you chanting? What do I have to do? What must I eat? No, no, no! It's much simpler than that! It's what you don't have to eat - animals! Not eating animals reduces your risk of getting heart disease, cancer, stroke and diabetes. Don't eat animals - get a longer life expectancy - it's that easy! 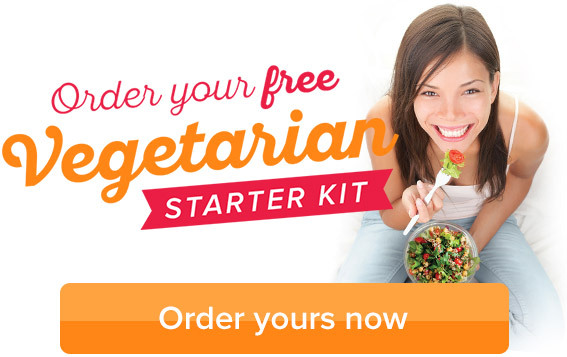 Your Mum's been telling you to eat your vegetables forever, so what better way to make her happy? Have You Heard Our New Radio Ad? Most of us grew up with songs and stories of idyllic farms where all the animals lived happy lives together. It's no wonder most people just assume that the pig on their plate or the chicken who laid the egg they're scrambling lived a happy life and was cared for before she died. But as you know, that's not how the story goes... and Animals Australia's new radio ad campaign is out to burst that bubble. So have a listen here. Please share this new ad campaign with all your friends. For the animals! Animals Australia and Unleashed are about to embark on our biggest factory farming campaign ever � an Australian first � and we need your help to name the cute little pig who will be the face of this campaign. Everyone knows the cute little pig from the movie Babe, and Wilbur from Charlotte's Web. Well this pig is going to be next in line of pig fame. Though not a movie star, the work she'll be doing is so much more awesome � she'll literally be changing the lives of her brothers and sisters who are stuck on factory farms. So get those neurons working and let's rename this Jane Doe to be the best ambassador for the biggest anti-factory farming campaign Australia has ever seen. This larger than life costume pig could have your name all over it, and when you see her at supermarkets or in the street (very very soon), you can tell your friends "I named that pig." What's even cooler is that she is the only one that exists in Australia (and the world) who is being made specifically to combat factory farming! UPDATE! It's official! "Lucy" has just made her debut and is presently on the campaign trail to end factory farming! Thanks for all the GREAT name suggestions everyone!! Last Monday (12 October) Michigan passed a bill that will see the phase out some of the cruelest confinement methods used in the farming industry. Within 3 years, dairy calves in Michigan will no longer be confined in tiny veal crates and starved of iron to make their flesh pale and soft. Battery cages , used to confine egg-laying hens, and gestation crates used to confine mother pigs, will also be phased out. With these significant improvements for animals Michigan has become the 7th state to ban gestation crates, the 5th to ban veal crates and the 2nd to ban battery cages. And the good news just keeps coming! 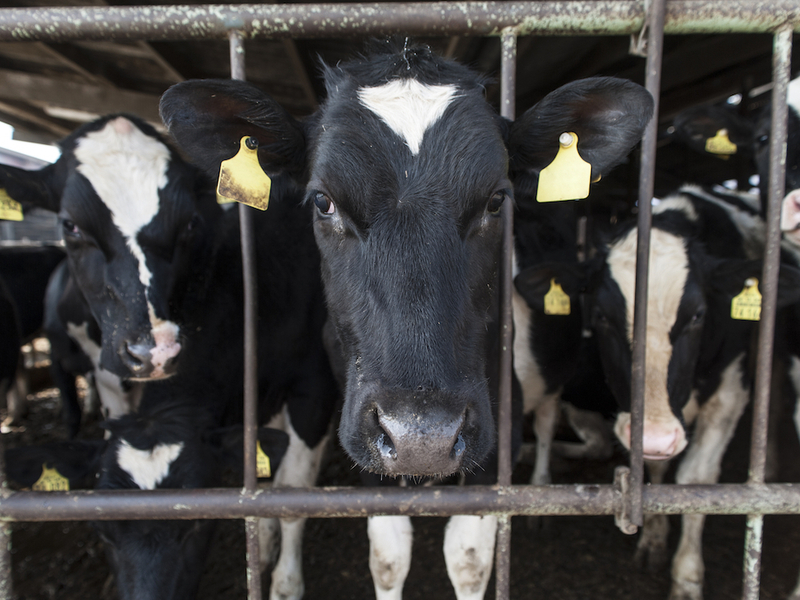 California - who have already banned veal crates, gestation crates and battery cages � have added to their list of �no-no�s� tail docking of dairy cows. A good sign from one of the US's largest dairy states, and very good news for the 1.8million dairy cows in California! While we're on the topic of changes for animals, the city council of Santa Monica (also in California) has voted in favour of drafting new legislation that will restrict animal 'declawing' � ie. the practice of painfully removing animals� claws. Meanwhile, over the other side of the world in a little place often known as 'the lucky country', farm animals aren't so lucky. Recently The Greens in ACT (and Tas for that matter) put forward a Bill that would ban battery cages from ACT (meaning only one business would be affected) and the Liberals and Labour teamed up to shoot it down (same story in Tasmania). With the many other parts of the world making huge advances for animals, it is disappointing that Australia is still dragging its feet. Well, the Aussie government may be stuck in the dark ages, but the good news is none of us need to be. It was only a matter of time � raising animals for food in filthy overcrowded sheds was bound to come and bite us in the backside, but when Swine Flu broke out in Mexico we didn't expect to see it in Australia any time soon. And before we knew it, we became one of the nations with the greatest swine flu count per capita. And now it's been found on a factory farm in NSW � the very place it originated (ie. a factory farm in Mexico). Pork representatives are trying to convince us that it's still safe to eat pig products, but really, was it ever safe?! If you ask the World Cancer Research Fund: "The scientific evidence linking processed meat [ie. ham, bacon, salami, etc] and bowel cancer shows that the best amount to eat is none at all." Eating pigs is not only dangerous for our health, but the conditions they are raised in (confined in cages surrounded by their own waste products) is just a breeding ground for disease � a disaster waiting to happen. Anyway, who's the one telling us it's safe? It's the Australian Pork Industry (surprise!) � the same people who make a buck off selling it. I kind of see it like a thief telling you it's safe to leave your bag with him. Personally, I'm content to chow down on my FLT (facon, lettuce and tomato sandwich) and leave the pigs in peace. If you've picked up a newspaper lately you may have noticed pigs have been getting a bit of attention (and I don't mean swine flu). Recent investigations in Australia and NZ have revealed just how bad factory farming can get (and as someone who's seen a lot, even I was shocked). Mike King may be a new name to many Aussies but in NZ he's a familiar face. The NZ comedian and TV celebrity was until recently also the face of NZ Pork. That is, until he found out where NZ Pork came from � factory farms. With the help of undercover investigators King saw a factory farm first hand. The footage from this investigation was aired on the NZ current affairs program Sunday, to much public outrage. And it's no wonder people were outraged. The NZ 'codes' for pig welfare (and the Australian 'codes' for that matter) effectively make it legal for farmers to be cruel to pigs. For example, they permit sows (mother pigs) to be locked in cages called 'sow stalls' which are little bigger than their own bodies. Meanwhile back home, an investigation into one of Woolworths' major Tasmanian pork suppliers has exposed one of Australia's worst ever cases of commercial animal cruelty. Investigators found starving sows with legs so swollen they couldn't stand to reach food or water; one mother pig had been left to die in her own waste with a shoulder wound rotting and filled with maggots. It was some of the worst footage I've seen. And this supplier, Gary Oliver, supplies roughly 20% Woolworths' Tasmanian pork! So the big question is how did Woolworths' react? Well, it seems they've given Mr Oliver a slap on the wrist; told him to clean up his act; and now it's back to business as usual. Bit if you ask me, anyone who can leave an animal to be eaten alive by maggots should not be paid to 'look after' animals. But the story doesn't end there. 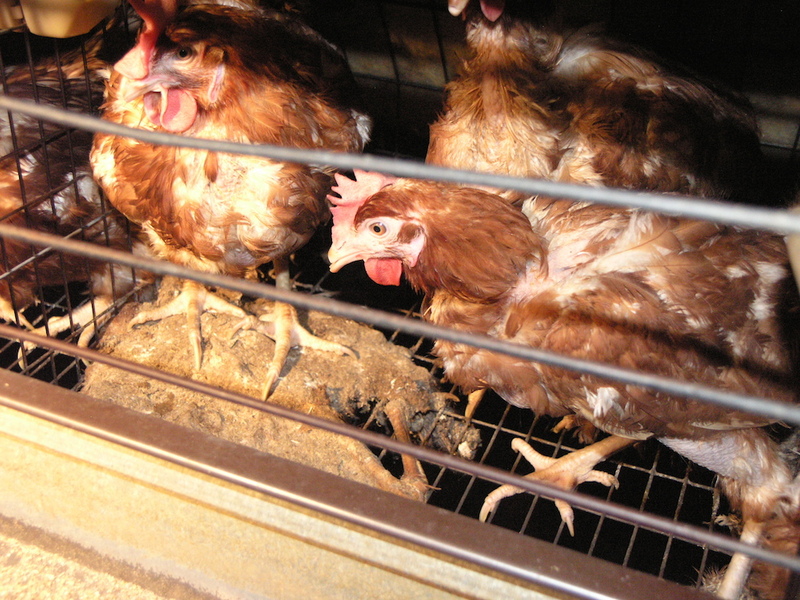 Last week one of Woolworths' major Tasmanian egg producers was also convicted of animal cruelty. On at least 2 separate visits to Sun Valley Poultry a government inspector found hens crammed into tiny cages on top of the rotting corpses of their dead cage-mates, to the extent that they could not even stand properly. The inspector found another 27 dead birds left to rot in their cages; not to mention birds covered in manure; and one dead bird being cannibalised by a distressed cage-mate. So it seems that the 'fresh food people' need a shake up. Rotting birds in tiny wire cages and dying, maggot-infested pigs is not what I'd call a 'high standard' of animal welfare! If this sort of cruelty and neglect on factory farms makes you sick, then let Woolworths know. And if you've already written once and weren't happy with their response (I certainly wasn't!) then here's a few tips for how you might respond to their letter. So over the past few weeks we have been warned of the deadly outbreak of "Swine Flu" in Mexico that is now spreading around the world. There has been much debate about whether we are treating the pandemic too seriously or not seriously enough, and more importantly whether it really came from pigs and if pork is safe to eat. The name was even officially changed from �Swine Flu� to �Influenza A (H1N1)� to try and re-assure consumers that eating pig products is safe. But if you are like me and countless others who have been writing to newspapers and reading up on the situation, I bet you've been remembering the panic when bird flu broke out and thinking "when will they get it, factory farming is a recipe for disaster!" Where the Swine Flu outbreak started, in Mexico, is just 5 miles from an "industrial pig facility" which "processes" close to a million pigs a year and is jointly owned by the world's largest pig "processor", Smithfield Foods (Isn't it ridiculous that these places are referred to as "facilities" rather than "farms", why don't they just be totally honest and call them prisons?) (you can take a tour of this 'facility' with Sharon Churcher, here). Smithfield Foods says the outbreak was not a result of its facility and that none of its pigs have the virus. But Smithfield Foods have less than a splendid track record with hygiene and honesty. Whether or not this particular facility was responsible for this outbreak, the question has to be asked, how can factory farms NOT inevitably spread disease? There are hundreds of millions of pigs and chickens crammed in unnatural, stressful environments in these "facilities" all over the world. They are often fed antibiotics in their food to stop them from getting sick in these breading grounds for disease called factory farms. Frequent use of anti-biotics is KNOWN to result in super-bugs that become resistant to the drugs. The huge amounts of waste they produce is not treated the way human waste is, it is instead channeled into huge open-air ses-pits, or as the "facilities" like to refer to them, "lagoons". These lagoons attract large swarms of flies that feed off the untreated waste and then may fly to local communities. And of course, the health of communities living near factory farms can also be seriously affected (as a great report called the PEW Report discusses). With all the warning signs - the hideous animal cruelty, the previous pandemic scares and the devastating environmental toll - we have every reason to be worried of a disease outbreak. And yet people are still encouraged to chow down on their pork chops and chicken nuggets. It seems we are too scared to face the awful predicament we have gotten ourselves (and the animals) into with factory farming. "Swine flu is a result of the inhumanity practiced by pig farmers who prioritise profits over animal welfare. People who eat pork products ignore that the pig industry severely harms the environment and the pigs. "How sadly ironic that as humans abuse animals, forcing thousands of pigs and poultry into squalid factory farms, their viruses combine and evolve into new strains that teach us a deadly lesson about the everyday abuse of animals to satisfy human greed." 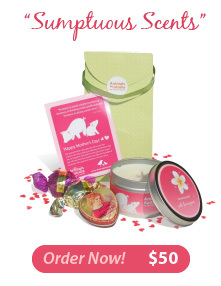 1 x all-natural Ecoya 'wild frangipani' soy candle, 1 x Pure Gaisha 'White Tea & Ginger' solid perfume in a heart-shaped tin, 2 x Constant Craving dairy-free chocolate truffles, and a Mother's Day Gift Card, which highlights how the proceeds from this gift will help shine a light on the plight of mothers in factory farms in Australia. 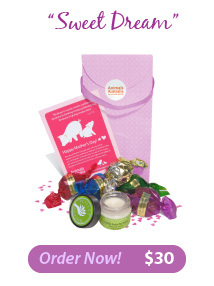 1 x Perfect Potion 'Vanilla Bean' lip balm, 5 x Constant Craving dairy-free chocolate truffles (Jaffa Delight, Coffee, Scorched Almond, Coconut, and Apricot Dream), and a Mother's Day Gift Card, which highlights how the proceeds from this gift will help shine a light on the plight of mothers in factory farms in Australia. Check out the Unleashed store for plenty of other great gifts. Pick some flowers from the garden and bake her some heavenly vegan cupcakes. Make her a delicious brekky in bed, with: fruit salad and fat-free banana pancakes. Or visit WhyVeg.com for other great recipe ideas. As a child I adored the Easter Show. My Dad used to even let me have the day off school so we could beat the weekend crowds. My absolute favourite part was visiting all the farm animals. Combine this with fairy floss, roller coasters and show bags and it was truly kid-heaven. Despite being a sensitive, animal-loving child, all the cruelty surrounding the housing, transportation and ultimate slaughter of these animals never clicked. And why would it? The show is set up in a magical, fairytale way with all of the cute animals and none of the horrors that they must endure. First you might go to the nursery stalls where you see happy piglets, chicks and ducklings playing and snuggling up to their mothers. Then in the dairy stalls they explain the "nutritious benefits" of dairy and make the whole milking process seem totally natural. Moving onto the adult pigs, cows and chickens you stop to pat them, make a connection with them and admire their ribbons. Everything is clean, there is lots of space and the animals look healthy and well groomed. Then in the next room, there's a diagram explaining which cut of meat comes from which part of the animal. It is here that you might feel a moment's guilt at the fact animals are slaughtered, but you think "well, they obviously have happy lives up until the end, and this nutrition panel says I need meat to be healthy... gee, I think I'll go have a dagwood dog". You then walk off, feeling on top of the world, singing "Old McDonald" in your head ... thinking everythings ok.
What they forget to mention is that baby animals are taken from their mothers in factory farms and that they have painful surgical procedures performed without aesthetic in their first fragile days of life. Nor do they tell us that a mother cow isn't just milk making machine�she is forced to give birth every year to continue lactating, only to have her baby taken away from her and slaughtered. Oh and of course they don't mention the fact that these animals are a tiny few of the 500 million Animals in Australia who, back on factory farms, are kept in prison-like conditions, denied freedom of movement, that would be illegal if they were a cat or a dog! No wonder we grow up with a warped and romanticised view of the animal farm, when even as kids we have the wool pulled over our eyes at shows like these! And don't even get me started on the utter cruelty of the rodeos, and the awful leather and skins shops. So you won't find me at "The Greatest Show on Earth" this year. I'll be spending time celebrating a cruelty-free Easter with my family, friends and ferrets. Who's Scared of a Little Girl? It's the voice of a little girl that has been holding a nation of radio listeners to attention over the past month. Thanks to Animals Australia's brilliant "Lucy Speaks" campaign, people all over the country are awakening to the awful truth about where over 90% of Australia's pork, bacon and ham comes from. This has the Australian Pork Industry running scared. So scared, that their top exec's have called an emergency meeting in Canberra to draft a "media battle plan" to combat the campaign. It would seem the truth hurts, APL. It hurts even more when the Sunday Age publishes a story about the success of the "Lucy Speaks" campaign on their FRONT PAGE! While the pork industry is likely to recruit expensive media experts and spend buckets of money trying to convince the public that they 'care' about the millions of pigs they lock up in factory farms and surgically mutilate without pain relief every year, we have a much simpler solution: follow the lead of countries like Britain, Sweden and Switzerland, and stop confining intelligent animals in cages so small they can't even turn around. I mean�if the Pom's can do it�how hard can it be? If you haven't yet heard the chilling radio ads that Animals Australia is still airing around the country (thanks to generous public donations that are still flooding in in support of keeping the campaign on air), click here to listen.